I awoke early this morning. As a result I watched Jack Bobridge take on the hour record. The event is experiencing a spectacular resurgence with most of the fastest men on wheels lining up a tilt at some point this year. For years the event lay dormant, the heady days of Boardman vs Obree seemed consigned to the archive, a series of dusty VHS transfers on youtube the only reminders of the struggle. The event was kiboshed by a rule change limiting all attempts to the ‘athlete’s record’, using the same equipment as Eddy Merckx in 1972. In an era where technological change and science are the driving forces in improvement, it proved an anachronism. Brian Cookson tore up the rule book, opening it up to technological innovation and in effect luring in the big bike companies who now see it as both useful R+D and a raunchy shop window for their new bongo weapons. Watching someone ride for exactly one hour in circles should be one of the more boring spectator sports; to be filed next to ‘golf’ in the pantheon of crappy crap things done by crap people. However, it somehow transcends the rhythmic, soporific loops to become a narrative event. Everyone is aware of the record, the time gaps are assessed and checked and reinforced and reminded, the velodrome goes increasingly more batshit crazy and the souplesse of the rider, so delicately tuned over the first 30 minutes, unravels like a loose thread pulled from a hand knit jumper. The more the lap times drift out, the harder it becomes to rein them back in, the crowd sense an effort slipping away and implore the lone rider to greater heights in the battle against the clock. It’s a knife edge of total accomplishment and complete failure. There is no second place in the hour record; you make it or you don’t. And if you miss out, it’s measurable in metres. Boardman beat Merckx’ 1972 record by 10 metres. Bobridge missed out by 500 metres, fading at the end. In the spirit of useless comparison; I reckon at the peak of my form I might just be able to squeak in a shade under 47km. This is based on my peak 25 mile time and a friend’s Military hour record. Right now, I’d be lucky to knock out a 25 minute 10. Next up will be Rohan Dennis on Feb 8, then Alex Dowsett, if/once he’s recovered from his unlucky break, with Dame Sarah Storey contesting the women’s record in around 3 weeks time. Later on the year it’s likely that the big guns will roll out, with Cancellara, Wiggins and Martin all rumoured to be attacking time by riding in tight circles on siberian pine. It’s an exciting prospect. This morning was the second annual Odd Down clagfest. It’s a grotty, filthy, bike-destroying assault on the sensibilities. As such, it makes perfect sense to spectate, armed with a cowbell and a strange pink honky horn thing. I love watching cyclo-cross. It’s the most bonkers of all the disciplines and you get to see a wider range of suffering and confusion than in most other events. The course deviates through the woods hanging off the back of the Odd Down road circuit. Recent heavy rain had reduced the course to a quagmire. Even better. There was a huge field of riders, even more than last year, well over 100. Cyclo-cross is growing in popularity more quickly than any other branch of the support, in part because it’s accessible and there is a perverted camaraderie amongst the groterati, a collective insanity that can also be seen at hill climbs. The strongest, luckiest rider wins. 5 years ago you’d be lucky to lure one man and his dog out to a race day in Hengrove Park, which is stretching the definition of ‘park’ a little bit, unless by park you mean scrubland with a disused runway in the middle and some ruined industrial buildings, the playground of the NEETs. And the cyclocrossers. Next year i’m half-expecting to see a Fritewagon and bar selling Duvel, pumping out furious Belgian techno trance to an enraptured audience of low-country cyclofanatics – otherwise known as “all Belgians”. I staked out a spot in the woods and heckled like a madman. I rang the cowbell in Oli Beckingsale‘s face. A crowd formed and we cheered anyone who managed to ride their bike for more than 10 metres. The slope all but defeated them, making it the perfect spot to see crashes and some proper bike breakage. The birch woodland echoed with the sound of derailleurs snapping. 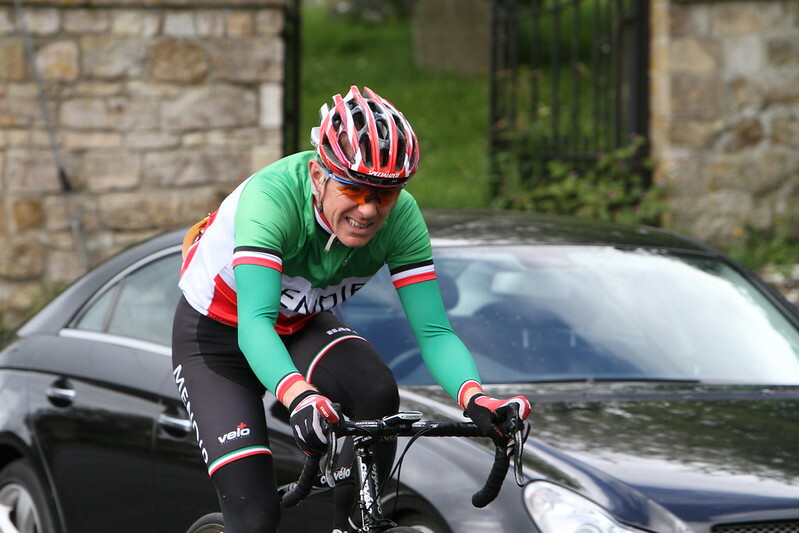 At the beginning the riders seemed to enjoy the challenge, revelling in the support and even smiling on occasion. By the end, all smiles had ceased, glassy eyes stared outwards, each orb a disconsolate and unthinking window into a mind shattered by the experience. A ghostly legion of pallid cyclists trudged onwards, destroyed in body and spirit by the accumulated trauma of 60 minutes in the woods. In years to come the locals will speak in hushed tones of the hauntings in the woods, how come January, if the weather is right, you can hear the sound of metal on mud, a hoarse tangling of twigs and chains, and the heavy, syncopated breathings of tortured souls condemned to circle through the undergrowth with bicycles wrapped across their heaving shoulders. All of which made for a startling son-et-lumiere show. It was fantastic. Hats off to the amazing VC Walcot, a club committed to cycling and the community and a rich example to all clubs of what grass roots sport can look like. I was trying to explain to someone recently what it means to ride in the BC National Championships. This involved the use of a clumsy analogy involving what it might be like for a very good club tennis player, or even district big-hitter, to take on Novak Djokovic at Wimbledon. It was as close as I could manage; Thursday’s race included the Olympic Time Trial Champion and The Commonwealth Games time trial champion and the winner of the Tour de France. They were the thick end of a very thick wedge of absurdly quick riders. Somewhere in amongst it all could be found a gentle sprinkling of club riders, whilst over there, looking confused and nervous and a small bundle of shivers growing afraid of it all and beginning to cry, was PJ. I spent at least some of the pre-race period sat on a sofa at Celtic Manor in my skinsuit talking to Matt Le Tissier. i didn’t know he was Matt Le Tissier until someone else came up and asked for a selfie to send their Southampton-loving chum. He looked a lot like Phil Tufnell. He seemed very friendly and not daunted by the lycra. He was aware that a race was going on. 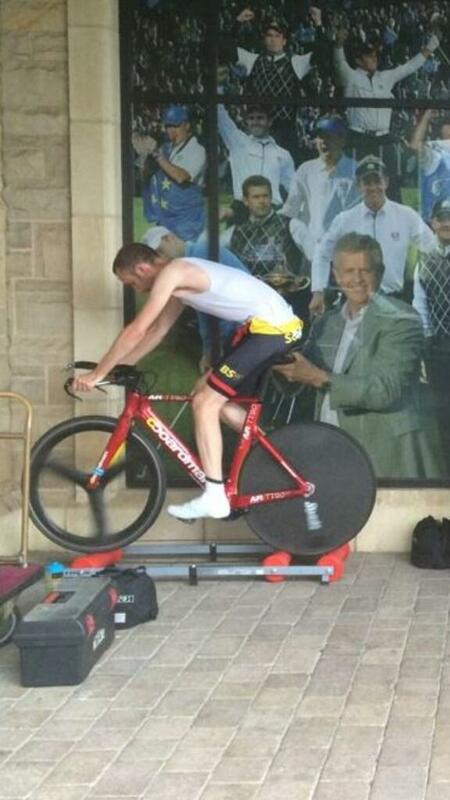 Bradley Wiggins then walked nonchalantly through and everyone stopped and stared. I took my rollers. This is unusual for me, but it seemed unlikely that there would be anywhere to warm-up, and the possibility of wet weather posed distinct problems. I was very glad i did, i managed to find a quiet spot to set up. What with Celtic Manor being a Ryder Cup location, it seemed entirely appropriate that Colin Montgomerie was able to offer a helping hand. After 4 weeks of beautiful weather, the heavens opened in time for the Elite race at 6pm. The roads were greasy and grubby. It made for some technical and hair-raising sections on the 12 mile lap. The start ramp was chronically exciting, as was the Hugh Porter commentary; at first. Hugh Porter is a legend of the sport, but his best years of commentary appear to be behind him. At times he seemed to have been switched with a confused dementia patient reading out some bingo numbers. I didn’t go full gas on some of the sketchy bits, it was too sketchy. Apparently Wiggins was fully committed and asked where the nearest hospital was prior to starting. I eschewed this approach in favour of a slightly lower key ride. Fortune favoured the brave, and i wasn’t that brave. At the end of the lap loomed the horrifying spectre of a steep and savage climb. There’s no way to describe the brutality of climbing up a 25% wall on a slightly overgeared time trial bike. I had the 42:23 on, I didn’t have anything else. This was fine; I am used to climbing on fixed so can turn bigger gears over when going uphill. It was hard and i had to stay out of the saddle all the way up. I could have done with something a bit lighter, but it didn’t make a huge amount of difference, the climb was vile. It’s worth noting for information purposes that it is harder than any hill climb i’ve done over the past 4 years. The saving grace was the smörgåsbord of red and gold; a cheering, baying mob of the Bristol tifosi, screaming encouragement. It took my mind off the climb. There are some other notable features that made this event the best race I have ever been involved in, notwithstanding the presence of several riders who I tend to idolise. It utilised a full road closure; not some rolling stoppages, but a full, barriered closure from start to finish. If you’re not used to riding on full closures it’s a weird experience. It takes a long time to get out of the habit of hanging to the left hand side of the road, rather than choosing the racing line through the long and sweeping bends. When you finally do get to taking the racing line through sharp right handers, it’s accompanied by a nagging fear, ‘i do hope the road really is fully closed and there won’t be any nasty surprises’. On the first lap I was led out by a motorbike outrider from the NEG group. This was an amazing experience; he signalled all of the slippery drain covers and hazards. After the first lap it was a free for all, there were more riders and more following cars. Such was my excitement at being in the biggest race of my life that I took every opportunity to throw out the rock horns, both on the first and second lap. I think that some spectators saw this a potentially foolhardy, or perhaps a sign that I wasn’t treating the race with due diligence. Ultimately I wasn’t taking it hugely seriously, I wasn’t in it to win, I was there to do my best, to represent the club and to enjoy it. I didn’t want to come to last. Essentially these were my goals for the race. And to throw some shapes wherever possible. I came 28th out of 60. Wiggins’ time was stratospherically fast; he is the reigning Olympic the trial champion. Outside of the continental riders, the bulk of competitors were within 4 minutes of each other; i was within this block, just. I came in 9 minutes behind Wiggins. I just kept it to within 10 minutes, which is how i imagined it would be. Getting to ride the event in the first place was a success, staying on the bike and making it round was even better, finishing within the top 30 at the National Championships, ergo, all of the country, and not being significantly adrift of the non Grand Tour stage winners, was the best of all. I was chastened and humbled by the level of support; Mum, nephew, wife and child, in-laws, club-mates, random strangers asking questions, the tweets and likes, everything. I raced yesterday on the Somerset levels. It wasn’t quite the same. It’s an unwritten rule of amateur cycling that at the precise moment when you should be riding the crest of the most stonking pile-up of form and fitness, things take a bit of a nosedive. A combination of excessively long working hours and an outbreak of the crippling medieval plague known as ‘hayfever’ have had a savage effect on any intention to continue with the current block of panic training. Today i returned to the F11-10 course in darkest homecountyshire with a couple of targets in the back of my mind. The first of these was to bag another 19. Both the Sphinx and I were of the opinion that a 19 should be on the cards as long as we both rode the course. In fact, rumour had it that they would be handing them out with the race numbers; there would be no need to ride. It’s the new face of time trialling; compare complex power-related numbers on internet forums beforehand, calculate the strength and direction of the wind, load up on ridiculous acronyms and then feed this all into an online weboracle called “Training Speaks”, which then chitters out a tickertape feed containing your time. Not being able to seek solace in the world of numbers and figures (see: “ooh i did an all time power PB and my CDA was off the hook, check out my TO and i totes nailed the blue CTL, and my FTP is like, AMAZEBALLS, even though i was 5 minutes slower than everyone else) it came to pass that we did actually have to ride the course at race pace and then actually try and achieve the projected time. If the 19 wasn’t on, then we were chasing the club team record with Andy, the erstwhile club skipper and all-round good egg. Jo Knight was also chasing the BSCC ladies’ 10 record – she achieved her aim with a super-rapid 23.38. On the epic, bongo-clad ride to the Spinkhaus in St Worstburg, calamity struck. The armrest bolts sheared off and it clattered to the floor. At that point there was only one thing for it; an EU mountain of duct tape. i’m glad i didn’t PB, otherwise this set-up would have been the only way to go. A bit like ‘mr ride in his pants’. It held firm for the duration of the race, which is far more than can be said for my mental fortitude, endurance and physical powers. Things started well; i caught my minute man within 3 miles or so. I’m not sure the rider up the road was at the peak of his powers; i’ve heard tell that he has had some form in the past and may have once ridden bigger races than the Hemel 10 and worn brighter jerseys. I resisted the temptation to ‘do a cavendish‘ because I’m not Mark Cavendish, I am a fairly hapless club rider from the westcountry. I also didn’t want to get a punch in the chops or a pump in the trispoke from one of British Cycling’s bona fide living legends. I think Yates climbed off after about 8 miles or so. I don’t think he was having a particularly good day. I wasn’t having a good day either; i did ok for the first 8 miles, but after that turned into a headwind and lost my way a bit, dribbling home in 20.24 for the 10. I was about 20 seconds down on where I perhaps should have been. That said, it was enough to help lower the Bristol South CC ‘Team’ record for 10 miles, a mark which had stood for 23 years. I also managed to throw out the ‘horns’ for the legions of paparazzi stood at the side of the arterial trunk road. I shall go away and brood for a bit and then hope that form returns, hayfever subsides, and tiredness abates. On current form i’m a hot favourite to destroy the hell out of myself. I’ve found it hard to write things lately; it’s a combination of being very busy at work and a vague sense that I didn’t want to retread old ground; churning out the same stories, suffering each time from the law of diminishing returns. I have been cycling though, with some small successes; i came 3rd in a time trial in Wales, recording 20.25 for the 10 miles. I was quite pleased but also slightly disappointed that i wasn’t closer to the 19 minute mark. It’s funny how expectations subtly recalibrate themselves without you even noticing. I managed to beat Matt Postle who was an accomplished roadman back in the day. I have no doubt that if it was back in the day he’d have put me royally to the sword. I also rode as fast as Matt Rowe (brother of Luke) and Dani King, who were doing the 2-up. Matt memorably ‘boxed’ with the Tour of Britain peloton when they came over Caerphilly Mountain. The club 10 last weekend was cancelled due to lakes of water on the course, which left a road race on Sunday to round out the weekend. It was promoted by Taw Velo and took in 7 laps of a hilly circuit in North Devon. We had 4 riders in the field. It was a tough day and riders were dropping off the back faster than an exploding plane spills passengers. By lap 5 or 6 there were less than 20 left. I clung on in, felt strong. On the penultimate lap i could feel the fickle pangs of cramp and knew it was going to be touch and go. At the bottom of the finishing climb it grabbed hold and destroyed my hopes of a placing; i dribbled in at the back of the group. Kieran rode a super race and took 7th place. One guy rode off the front after 4 laps and we never saw him again. It was quite chastening. Apparently he did it the week before as well. I got cramp on the way back to the HQ as well. I got dropped at about 8mph. Road racing is a complicated business; there are a huge number of variables to contend with and your destiny is rarely your own, if that makes any sense at all. You can minimise some of these, but at any given point there are decisions to be made and the wrong one can ruin the race. Tom (of Dream CC, a lesser outfit consisting mostly of cat 3s and juniors) argued succinctly that it’s probably best to sit in the bunch and not even think about what might be happening up front because it usually comes back together and you only get stressed out wondering if that might be the winning break. Tom gives good advice, but doesn’t always follow it himself – on Sunday he opted to attack long and hard at the bottom of an 8 mile summit finish in the Tour of Carmarthen. Not being Nairo Quintana, it didn’t work out that well and he got Kimmaged by a lady, by all accounts. What doesn’t kill you makes you stronger. The thing i struggle with, apart from the lack of control, the jostling for position in the neutralised section, the random skills of some riders, the fear that a moment’s inattentiveness might cause a catastrophic and costly crash and the vague sense that i’m a man with a fork in a world of soup, is the SURGES. These are designed to bankrupt the tester’s capacity to ride just below threshold for as long as it takes by taking you violently above this level for a very short period of time, repeatedly. I can just about do it, but it’s a struggle due to the absence of any similar efforts in my typical racing or training. The end result is a slightly crampy experience after a while. This weekend coming is the National Team Time Trial Championship. We’ll see how it goes; it’d be nice to mix it up with the fast men. It’s my first national outside of the uphill season and I’m riding with the Spinkmeister and Trotterz. Should be fun. I’m silently hoping that the occasional road races will add something extra to my time trialling repertoire. I had a recovery ride with Penny today, it was a stately 16 mile loop including a climb i’ve never done before. It was perfect. We found a secret grove of giant sequoias. It was very exciting. I want to give a really BAD time trial. I mean it. I want to give a time trial where there’s a brawl and seductions and people going home with their feelings hurt and women passed out in the cabinet de toilette. You wait and see. Time trials are much of a muchness. A group of men, often of a certain vintage, clad from head-to-toe in shiny, tighter than skin tight lycra, gather together in a layby littered with the pages of a discarded copy of razzle magazine and a once-used prophylactic. They then take turns to ride at speed in the inside lane of a dual carriageway for 10 miles, no more no less, before retiring back to the shelter of a village hall for tea and cake. It’s an act completed under the cover of the stillness of the pre-morning, the only speculative onlookers are the drunk wastaways and students completing the walk or drive of shame. Once the furtive act has been completed the lone rider can get changed and sneak back into the house; his absence not noticed because it’s not even 9am. And then there is the Megahilly. An apocalyptic battle of survival against the elemental power of gravity and the sheer, unrelenting and savage beauty of the Cotswolds. A mere 28 miles incorporating 3,500 feet of climbing. For some reason, the event is growing in popularity. Hardened veterans of the event now speak of the addiction; ask to be reminded why it is they can’t keep away, why they keep coming back for more. It’s acquired a metalanguage of battle, the semantics of war being the only vernacular capable of describing the horrors of the course. It’s a real time trial, a technical and challenging course where you have to kill a small dog just to be allowed to start and the citizens of Uley complain vociferously of ‘those shiny bike riders weaving around, like they wuz drunk, like, and being sick and that all over the hill, awful it wuz’. And it hurts, it really hurts. Iain Hounsell tries to find the right words, the right cog, the right rhythm, but can only grip the bars and hope the end will be soon. This is the second year i’ve organised the event. I chose to run it again because I like hills and was convinced to do so by Mike Hallgarth, the course designer. It used to be slightly easier, until Mike decided that the winning average speed needed to be kept as low as possible, and that a 20mph average should be a rarity to be celebrated. He succeeded. This year the startsheet was headed by Tejvan Pettinger, National Hill Climb Champion. Further down the field it promised to be a royal scrap with the fastest hilly testers in the district lined up to enact the slow dance of oxygen death on Frocester’s fabled slopes. In a similar vein to last year, road bikes far outnumbered the TT bikes. I don’t think there’s any question that a road bike should climb better than a TT bike, but that’s probably where the advantages end. Even on this course, there are enough stretches to justify the use of bongo-weaponry. I spiced up the dilemma by throwing in a handful of road bike prizes, enough to tempt the waverers. Tejvan showcases his superpowers on Crawley Hill. However, the magnets have fallen off his visor just like mine: he is human after all. I managed to squeak a spot in the field. I didn’t seed myself as a rider (said the bishop to the actress) because i wasn’t entirely sure i’d be able to ride due to the fairly intense duties involved in organisation. Thanks to fantastic help and support from the club, it was ok. I snuck in between the mighty atom (apologies to Eileen), Derek Smetham, and the VC Walcot blade-for-hire, Sir Tavis of Walker. Tavis nearly missed his start on account of a prior appointment with a small terrier on Adey’s Lane. He hit it amidships on his TT weapon, ending up in the hedge. The fate of the dog is unknown. He then legged it back up the hill to switch bikes, making it back down in a surge of adrenaline and confusion. It solved the equipment angst at least. Tav is a bit of a monster, but with me on the bongo and him on the road bike I steadily reeled him in. I also kept it level on the climbs with the splits being fairly equal. I made a superfast descent to Selsley after catching him over the top and over took a Honda 4×4 which was sticking rigidly to the 40mph speed limit. This was quite exciting. Tav tried the same trick but the Honda lady got a bit freaked out by being overtaken by one frighteningly fast bike person and slammed on the anchors, Tav got fresh with the back of the car, just like he got fresh with that dog. He has a line of ‘kills’ painted on his top-tube, mammals, children, adults, Chelsea tractors, anything impeding the pursuit of straight-line speed pays a heavy price. The last climb is Stouts Hill. It’s also the toughest. On approaching the bottom it’s easy to think ‘last climb, let’s rag it, make up the time’, but it’s not possible. A string of riders are lined up the hill experiencing the same dichotomy, betrayed by the fading legs and lungs. I was out of the saddle and caught three riders engaged in mortal combat. Something wasn’t quite right with the picture: the one in the middle wasn’t actually racing. He was a weekend warrior, out for a jaunt, and yet he stumbled across some real life bike racers, and to be fair, was giving them a bit of a hard time. I’m not sure how i’d cope if i got Kimmaged. I might never touch or look at the bike again. Despite it being a bit of a windy day and arguably slower than last year, I rode pretty much the same time, within 2 seconds, for a 1.22.48. Derek was 3rd, at 30 seconds. I was pleased to come second. Tejvan Pettinger, unsurprisingly, took the win. It’s worth noting that the Hill Climb course record on Stouts is 4.58 by James Dobbin. I’ve managed 5.09. During the race today I managed 5.54. Tejvan Pettinger scaled the heights in a frightening 5.18. All told, Tejvan made it round in 1.17.17, or 5 minutes quicker than me. In short, he bagged about 45 seconds per climb, more on the longer ones, and also eked out time on the flatter seconds. It was a masterclass in hilly time trialling and he was imperious. He managed to take 36 Strava KOMs during the ride. Sometimes a race can be won or lost by a slim margin; last year Derek edged it by 6 seconds. I think i know where those 6 seconds went. This year, it’s a little bit hard to tell where exactly those 300 seconds disappeared to. All told it was a successful event; no-one crashed (apart from the dog thing) and people seemed to enjoy the masochistic side of things. There is something curious about the out and back aspects of the course; you get to see other riders far more than in a typical time trial and there is a hushed solidarity. Everyone is fighting the same battle, trying to get up Frocester Hill, or London Road, or Crawley, or Selsley, or Stouts. And at the end, there is a shared sense of achievement, it was hard for everyone. Even the winner. I may ignore his suggestion for two laps. Although he has planted a seed. 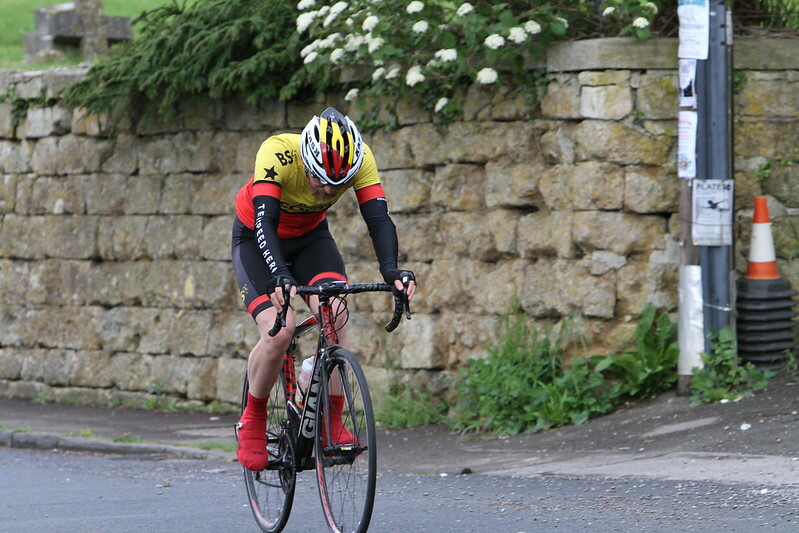 This week heralded the start of the club time trial season. The opens have been rolling along for a few weeks now, but the midweek specials only appear after the clocks have changed. If it’s a Tuesday or Wednesday night you can guarantee that somewhere near you a local cycling club is running a time trial. The full list of club events in the West district can be downloaded here. Club events are great for newcomers to the sport; the atmosphere is relaxed and calm and it’s entry on the line. It usually costs about £3 per ride and you don’t need a racing licence or to be a member of a club to ride. The first 5 events in our Classic League series take place near Aust on a short 5.2 mile circuit. They run on the short circuit for two weeks, before doubling up for the next few weeks. After that we move down to the Chew Valley Lake series. I first rode the Aust circuit in 2010, scraping round in 11.50 or thereabouts. The following year i shaded it down to an 11.20, then an 11.03. In 2012 I squeaked it down to an 11.02, then broke the elusive 11 minute barrier with a 10.59. Last year i chipped away a bit more with a 10.46. By this point the course record started to seem like it might be a possibility, but only on the right day. Finding the right day in April on a course adjacent to the sweeping expanse of the Severn Estuary is not straightforward. I knew several things: Andy Sexton set the course record; he is a big and powerful bike rider. Rumour has it that afterwards he was sick in the bushes. It’s a short course which seems simpler but can be deceptive; the temptation is go absolutely flat out, but this can lead to real difficulties after a mile or so. Judging just how far you can push it without completely blowing up is the key to riding this course well. In order to beat the course record a 29.4mph ride is required. i consider this to be a fairly heavy bit of stem slammage. It’s an upside down 35 degree MTB stem. THIS IS BONGOWAR. I did a wobbly trackstand at the start due to the absence of a push. I think it saved me vital seconds. I then hooned it off down the road, stuck it in the 54:11 and churned the massive gear; making it to the turn at about a 29mph average. If the return was quick, then the record was on. Fortuitously, the crosswind seemed to help rather than hinder and I gave it everything on the way back. It was painful and a few times i dropped into the 12, only to force it back up and drive the pace on. It was squeaky bum time; the average speed suggested it was on, but i knew i had to keep it moving and that there was no margin for error because of the short distance. Furthermore, it finished on a drag upwards to the line. My heartrate peaked at 185 and averaged 178 for the race; average speed was 29.4 with a maximum of 33.3, making it a fairly consistent output. I started my garmin late, but had a feeling I’d done enough. I had to check with the timekeeper and he confirmed a 10.35; creeping in 2 seconds underneath the existing mark. It made me very happy. It’s hard to measure progress, year on year, due to the endless variables involved in bike racing, but when you’ve gone faster than everyone else over a set distance there’s a certain satisfaction and an inescapable sense that you are going well. It’s a concrete achievement. After the race we all headed back in a long train of bongo weaponry. I really enjoy riding with the other members of the club; it’s supportive and there is a feeling of camaraderie that exists, celebrating each others’ achievements and offering advice and consolation when it doesn’t go so well. There are a few more events at Aust. I worked out that a 30mph ride on this course would need another 15 seconds. That’s quite a lot. A 10.20 is unimaginably quick for the South Gloucestershire badlands. Maybe if it’s a total ice-cream float of an evening a few more seconds might emerge from somewhere, but definitely not a baker’s dozen. This weekend is the club open 25. It’s a prestigious race with a trophy containing an illustrious list of names from the history of the sport. John Woodburn won it in 1959, Bill Holmes set a competition record and won the trophy in 1955, ‘King’ Alf Engers won in 1972, David Lloyd in 1982, John Pritchard twice in 1983 and 1991. I’m looking forward to riding.